I wanted to be a DJ from a very early age. At just 9 or 10 years old, I had a pretend radio station in my bedroom, comprising two cassette machines and a 2-channel mixer from Tandy. My bedroom walls were covered with car stickers and presenter photo cards from every radio station in the country. This was before Internet and email, so I spent a lot of time writing letters by hand to radio stations. I grew up with music playing throughout the our family home, usually Motown and Northern Soul. When I started buying my own records, on vinyl and cassette, they were the chart singles and compilation albums of the time, including New Kids on the Block, and Betty Boo. Although I enjoyed playing them in my bedroom, I soon discovered a far greater pleasure in playing them for other people. At 13, I was very lucky that Father Christmas brought me disco equipment and I was soon doing kids parties at community centres and church halls in my home town, Barrow-in-Furness. 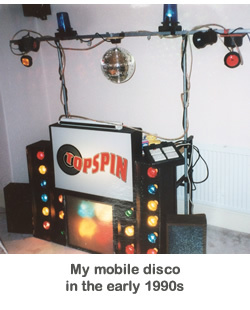 I had quite a monopoly on school discos, with many scheduling their end-of-term disco around my availability. At 15, I became “resident DJ” at Barrow Cricket Club, so I had to learn fast because the job involved catering for the full range of private functions such as weddings, birthdays, christenings, retirements and anniversaries. To build-up my catalog of older music, I bought box loads of 7-inch records from car boot sales. As a shy teenager, I became hooked on the thrill of playing music at high volume, in a room full of people, and watching what effect each song has on the atmosphere in the room. I loved it, and was bursting with ambition! At 18, I progressed into bars and nightclubs, initially in Barrow where I did weekly nights in venues “Circus Circus” and “The 99 Club”. 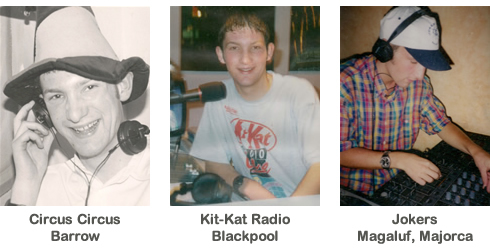 I then left home and spent 2 years in Blackpool, working on Kit Kat Radio at Blackpool Pleasure Beach, followed by an enjoyable summer of 1998, playing 7-nights-a-week in Jokers, Magaluf. 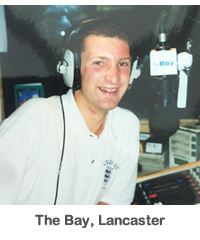 Back in the UK, I was delighted to get my own radio show on “The Bay” which was the most listened to commercial radio station around North Lancashire and South Cumbria. I’d listened to The Bay for many years and felt a huge sense of achievement and responsibility, to join their team of presenters. But at the same time, the insight into daily life at a radio station, made me re-evaluate my future and start thinking of other careers. By this time I’d met my future wife Angela and we moved to the North East together so I could study for a Media degree at University. I didn’t stop DJing though, and spent 3 years as a party DJ in the busy bars of Newcastle Quayside. After graduating, we then moved back to the North West where I got a day job as a Web Developer, and a Saturday night residency in a nightclub in Preston called Mood. I also helped launch a new radio station in Blackburn called 107 The Bee, and have some happy memories of my Sunday show there, with guests including the famous Irish singer Daniel O-Donnell, pictured below. I returned to my “mobile disco” roots, around 2009, investing in good quality equipment, and specialising in Lake District weddings. Since then, I have gained a good reputation with the major hotels around the area, and I am pleased that most of my work now comes through recommendations. After doing the job almost 30 years, I still get the same buzz of excitement by playing just the right song, at just the right time, to create one of those “hands in the air” moments. It’s my addiction. Here I am with my wife and two sons.